Almost each young person is starting his or her career with dirty jobs such as cleaner, janitor, porter or refueler. This girl is not an exception. 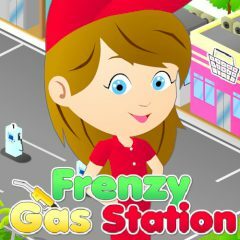 She is working at a gas station, and needs your help in her difficult work in this online flash game. Are you ready to serve all customers as quickly as possible and earn as much money as you can? Almost everyone of us used to work as a cleaner or refueler when we were students. This girl and this boy are working at a gas station. This can be a good start for their career, thus you must help them in this amazing arcade game. Serve as many customers as you can every day and earn as much money as possible. So, are you ready to help the two refuelers to achieve their daily tasks and to move up the career ladder? Then welcome to this nice game developed by Free Games Jungle!